Parenting is an endurance test, to be sure. But sometimes the shoe moves to the other foot, and children have to endure their parents. Such was the case in 1998, when I packed the car with suitcases and three children, and headed off to explore the roads and roadside attractions of Pennsylvania. Ellen’s and my vacation times weren’t in sync back then, so I would take the kids on my own for what I’d thought would be a great vacation. Katie was ten at the time, Jonah eight, and Aiden four. The idea was to drive for a while into a nearby state, stop at restaurants and motels along the way, and find interesting places to visit. I prepared arduously for these trips, blissfully unaware of how tolerant my children would need to be in order to put up with my naive belief that we’d all love these adventures. What it ended up being was an interminable combination of mindless, limb-numbing hours in the car, too much fast food (not for me but for the kids! ), mystery motel rooms which just as easily held magical mini-bars filled with chips and cookies as menacing families of cockroaches in the tub. Our first road trip brought us into the State of Pennsylvania, to which we journeyed in search of trains and the Amish. It was in Strasburg, PA, that we found them both. While riding the 1800s-style Strasburg Railroad into the countryside of Lancaster County, we were all delighted to see Pennsylvania’s Amish folk carriaging back-and-forth alongside us. 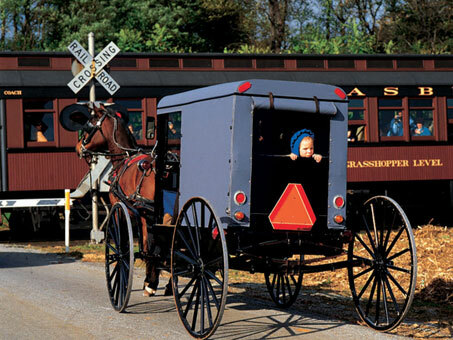 Of course, while the trains were a perfect preservation of the past, the Amish were as contemporary as they were ever going to get (which, for them, meant the 1720’s). My kids were fairly enthralled by all of this and, for a brief moment, it looked like I’d done okay on my trip planning. Alas, the hours in the car, interrupted only briefly by uninspiring stops at McDonald’s and KFC, did not keep me high in the popularity polls. Katie’s leaving Claudia, the bunny she’d kept close by from the day she was born, in one of the motel beds did not improve things. We wouldn’t see Claudia again until she arrived home squeezed tightly into a shipping container courtesy of some kind motel staffperson who’d found the doll in the laundry. Needless to say, I don’t think Claudia joined us on future road trips. The kids, to their dismay, were not presented with a similar choice. We brought two souvenirs home with us from our Pennsylvania road trip. The first was a train set. A starter set. Set us back three hundred bucks, it did. We had big plans. Wanted to build a whole city around it, just like the one we’d seen in Strasburg (yep, in the model railroad store). We set up our starter set exactly once. Next I saw it was years later, when Ellen was carrying it to the car to give away. In case you don’t recognize us! Our second souvenir lasted a bit longer. It’s the one-and-only photograph from our entire Pennsylvania road trip. We had it taken at one of those photograph dress-up places. The four of us put on Western garb; I think we were bank robbers, probably train robbers. I’ve sometimes wondered about there being no other pictures from this trip. Apparently, Ellen was still the sole family photographer, a role she would begin to share with me the following summer when our road trip took us into upstate New York and Niagara Falls and where, for a very scary few minutes, we lost Aiden. But that’s a story for another time.